A production is not only composed of the series or movie’s scenes, there are also animatics, backgrounds, character builds, colour models, references, storyboards, and so on. These elements must be stored somewhere. Most of these elements can be stored in the Harmony Server database. Generally, a studio will create a special Job for the models. In the Environment, you will find Jobs for the episodes: ep001, ep002, ep003, and so on. Each of these scenes contain the colour models related to them. For example, the character scene will have one layer per character containing all of the colour model drawings belonging to it. If a movie has 50 characters, the character colour model scenes will contain 50 layers, each with a different character. If the character has five different models such as raincoat, regular clothes or pyjamas, the character’s layer will have five drawings. In the same model job, you will find the cut-out character builds scene. Unlike the colour model scenes, the build scenes only contain one character. As a character build is composed of many layers and functions, it is not recommended that you build more than one character per scene. So, if a movie has 50 cut-out characters, the Job model will contain 50 character builds scenes. Even if you have a structure integrated in Harmony, it is recommended that a root directory be created for your external elements such as audio clips, bitmap backgrounds, references, and so on. This directory should be stored on the server or be regularily backed up if you are a single user working on a standalone machine. The Root directory contains subdirectories which hold such elements as animatics, backgrounds and audio files. You must create these subdirectories and name them accordingly. For example, store the backgrounds used in your production in a subdirectory called backgrounds or adventure_backgrounds. Keeping an organized work structure will give you greater control and ease. You can further improve the organization by grouping similar elements into categories. 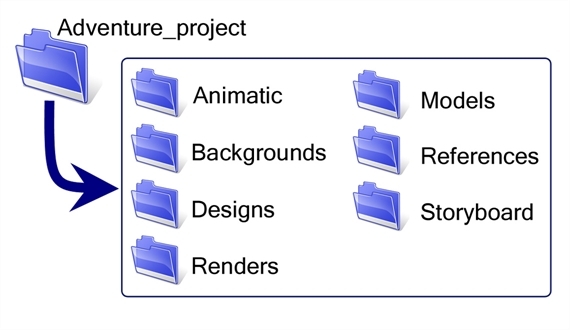 Animatic project and movie files can be stored and organized in this folder. Backgrounds can be stored by sequence or episode in the same way that animation scenes are. Create a subdirectory named Backgrounds and then place a sequence or episode subdirectory inside it. Categorize each background by episode or sequence. Categories for locations and backgrounds can also be added if you are creating the designs using Harmony. Final Editing projects and renders can be stored and organized in this folder. The Library folder should always be stored on the server, even if it is not included in the root directory. A library is generally shared between all the users working on the production as they will link this library to their Template Library and reuse its contents. You may also need to add categories for the backgrounds and model pack. Note that you only need to create a Models subdirectory if you are not designing the models in Harmony. Images: These may be any subject from which you can gain ideas and inspiration to help develop your project, For example, if you are producing an 18th-century adventure series, you may have images of period costumes, buildings, and sailing ships. Pictures: You can also use photographs of items which may help you produce an accurate account of the time period in which your production is set. Create a Render subdirectory and categorize the exported image sequences or clips by scene. For example, you would have a subdirectory named Render and categories named Scene_001, Scene_002 and so on. Create a subdirectory called Render and store your scene’s render in a subdirectory named sequence. Create a subdirectory called Render and store your scene’s render in a subdirectory named episode. Toon Boom Storyboard Pro projects or storyboard scans can be stored and organized in this folder. You can create a bitmap texture bank for pen styles and colour palettes and store all of the files in this folder.